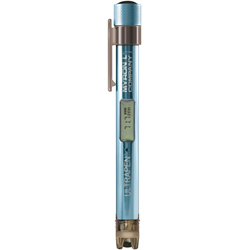 The Ultrapen PT6 is a nitrate and temperature test pen that is accurate and simple to use in diverse water quality applications. The ISE sensor measures the electric potential of a solution as it is affected by nitrate activity and is compatible with U.S. EPA Method 92010A. It can display the results as nitrate, nitrate as nitrogen, and directly as millivolts.